America must rise to the occasion and remedy contemporary deficiencies with an unwavering patriotism that honors our democracy, Constitution, and freedoms. The current issues that demand attention are police-community relations, compounded by our culture of violence and crisis of leadership. These problems impact not only communities, corporations, agencies, schools, and families, but the very moral fabric of America. America must forge partnerships throughout every level of society as collaboration is critical for renewal. On Tuesday, Oct. 4, this collaboration was evident with a unique conference that focused on ethical leadership, violence prevention, and building bridges of trust with police and communities. 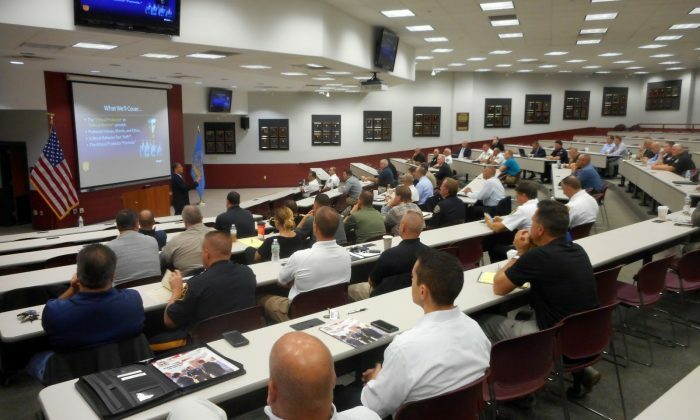 The event titled “21st Century Policing: America’s Ethical Guardians” was held at the Bergen County Law and Public Safety Institute (BCLPSI) in Mahwah, New Jersey. It was a collaboration of Bergen County Prosecutor Gurbir Grewal, the Bergen County Police Chiefs Association (BCPCA),the Bergen County Sheriff’s Office (BCSO), and BCLPSI in partnership with Vincent J. Bove Speaker Services and Resolution Group International (RGI). Over 100 law enforcement rank and file officials attended the event from agencies throughout the region. These included large agencies such as the NYPD, Port Authority Police Department, New York State Police, New Jersey State Police, BCSO, Jersey City Police Department, and United States Marshalls Service. Smaller agencies also were represented, including the West Orange Police Department, Verona Police Department, Rutherford Police Department, Garfield Police Department, North Bergen Police Department, Emerson Police Department, Mansfield Police Department, Wyckoff Police Department, and Livingston Police Department. The representation from local, city, county, state, and federal agencies represent the make-up of American policing nationwide. As a member of the BCPCA for the past fifteen years, it was an honor for me to develop the program in collaboration with its president, Chief Frank Regino of Westwood, Sheriff Michael Saudino of the BCSO, and Chief Louis Ghione, (retired) from the North Arlington Police Department. It was also a privilege to serve the event as one of the two featured speakers. My presentation titled “21st Century Policing: America’s Ethical Guardians” used my signature metaphor of a train wreck caused by a head-on collision. This metaphor dramatized the crisis of leadership and culture of violence throughout America. During my presentation, highlighted with graphic slides, I also addressed America’s broken family crisis, the gang culture, substance and alcohol abuse, principles of visionary leadership, and current police-community controversies. Numerous reports, including the “Final Report of the President’s Task Force on 21st Century Policing,” the “Investigation of the Ferguson Police Department,” and the “Investigation of the Baltimore City Police Department,” were identified and summarized. Attendees were encouraged to carefully study these documents, as well as my published articles in the Epoch Times over the last few years, as they punctuate police-community issues. The article titled “Transforming the NYPD: Terminating Toxic Police Officers,” published in the Oct. 14, 2014 edition of the Epoch Times was also shared and reviewed. In this article, I expressed appreciation for former NYPD Commissioner William Bratton’s remarks to 800 of his police brass during an Oct. 2014 retreat. In his customary transparency, Bratton addressed the small percentage of NYPD officers who are “poisoning the well” and needed to be weeded out. I stressed that the moral courage exemplified by Bratton has lessons to be learned for law enforcement agencies throughout America. My presentation concluded with a call to action, reminding all that law enforcement is critical to America, and as ethical protector’s, they must remain committed to the ideals of their noble profession. Jack Hoban, president of RGI, and coauthor of “The Ethical Protector: Police Ethics, Tactics, Techniques,” also delivered a presentation. It was inspirational, educational, and focused on ethical values that are critical to law enforcement. These values as dramatized during his presentation, include honor, courage, commitment, integrity, respect, justice, charity, freedom, dependability, and knowledge. A subject matter expert on martial arts and ethics for the U.S. Marines, Hoban has trained military and police internationally. He emphasized protecting life as the virtue that distinguishes an authentic ethical protector from others who would desecrate moral values in the name of a cause. Hoban stated the ethical protector upholds moral values because of his unwavering dedication to protecting the life of self and others, all others including a wounded enemy on the battlefield. The moral compass of the ethical protector, crystallized by Hoban, is the value of each and every human life and the commitment to protecting life, even in the face of personal danger. He also emphasized that the foundation of the ethical protector must be complemented by physical and mental health, communication skills, conflict resolution techniques, respect for the diversity of every human being, and moral courage. Post-traumatic stress disorder (PTSD) was also addressed during Hoban’s presentation. He stated that research shows three factors cause PTSD. These are either trauma, betrayal, or the guilt that comes from dehumanizing the enemy. Jack emphasized that law enforcement are called to be “ethical protectors” with a responsibility to serve and protect all, because everyone deserves dignity, respect, and protection. Everyone is a little safer because I am there. America must address the contemporary crisis of leadership, violence, and police-community mistrust with courage, honesty, and transparency. When we address these issues with the character, ethics, and leadership, we are on the path of being ethical protectors and reawakening the nation.